DeWalt has always been and probably always will be at the forefront of the gadget and tool world. Their products have great durability and they always suit a wide variety of customers which makes them extremely popular, from professionals in the industry to those who are just starting out – it doesn’t matter who you are, DeWalt will have a product or model you can use and will love. The DeWalt DW735 has a two-speed gearbox which allows users to change feed speed and optimize every cut they do, meaning that every cut will be a super smooth and fast one. It also has a fan-assisted chip ejection which vacuums the chips off the cutter head and ensures they’re exhausted from the machine meaning they’re out of your way and not to be thought about or seen. Despite being a great planer, it is expensive, the DW735 is a set up from the DeWalt DW734 model which means the price is higher but the quality increases too. Therefore, because the price is more expensive you are getting a better-quality product. However, as a DeWalt customer you will automatically get 3 years warranty on your planer which means if you have any material faults or issues with your product, it can be sorted by DeWalt themselves without any hassle at all. This model would typically appeal to a semi-professional or someone who would use the model a lot for work but not daily, the price is high which means you want to make use of it but it isn’t fit for industry use for those who work in the industry as a profession. For anyone who needs a planer that is easily transportable and isn’t too heavy to mope around then this is a great option. It isn’t the lightest planer you can get from DeWalt and there are definitely ones that are a lot lighter but generally for a semi-professional model it is a great choice. Since it comes with a lot of added features too it is ideal for those who do work on the go. If you’re a professional or someone who does a lot of work with planers then you will know how annoying it can be to get dust on your workstation, that’s why we love this feature so much. This model features a motorized fan that is able to break down any debris as it leaves the cutterhead and simply blow it into one of the dust shrouds that are included with the product. This is especially helpful if you’re doing a lot of work in a short amount of time as it gives you plenty of space to work and also ensures your station isn’t full of dust and debris that could otherwise can in your way. Likewise, to all other DeWalt products, this model is guaranteed a limited 3 years warranty which is valid if you don’t have it fixed or attempt to fix it yourself. The warranty is great as it means that you can call or email DeWalt directly, tell them your fault and they will either fix the model or send you out a new one. If the fault is anything to do with wear and tear though, you won’t be able to claim on the warranty. It must be concerned with the materials or maintenance. Is this ideal for beginner use? Despite being a higher price point than many beginners would be willing to pay, we would say this is suitable for those who are starting out but not the best you can get. There are other models which are better suited to those who don’t really know what they’re doing. This model is more ideal for those who have had planers before or generally have some knowledge about the industry. What is the performance like on this model? Since it is made for semi-professional use then it provides a high-quality finish and a professional grade result on all your cutting jobs. It performs extremely well but we would expect it for the price you have to pay to purchase it. It is expensive but the performance does reflect this and for many customers, it is worth the price as they see it more as an investment that will save them time and eventually money, rather than having to use cheaper models and having to buy a new one every few years. What are the knives like on this model? The razer knives included are reversible and disposable and they generally last 30 percent longer than any other traditional disposable knives which can be costly and time-consuming to re-sharpen. It is fast and easy to change the knife on this model and the cutter-head is ready to go in no time after you’ve done it. The customer reviews for the DeWalt DW735 model are generally positive which means that customers tend to like it and enjoy using it. Looking and considering customer reviews is essential if you want an honest opinion which will leave you with a great product. Positive opinions of this product include the idea that this model is expensive but worth the money you pay as it provides professional grade results for a commercial price and is especially ideal for small store owners who can’t afford bigger and more expensive models that are available. It is also very powerful and provides that extra support for anyone who needs it as the cutting system is sharp and precise. However, the price is a huge factor that lets this product down. 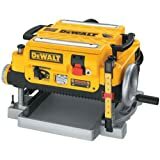 Even if it was slightly cheaper it would have a huge advantage over other product models but there are others that prove they work at a cheaper price, therefore unless you’re wanting the DeWalt name, you might want to see what other models and brands you can get for a similar or cheaper price. Customers on Amazon are positive about the model as suggest if you’re a small store owner that will use it then it’s worth your money. Concluding, we would suggest if you’re seriously considering purchasing this model from DeWalt to do it. It has a very limited number of negative aspects is worth your time as it can be life-changing to buy. The price may let it down, but you do get a lot of added features and extras for your money plus the guarantee of 3 years on top of this is a winner for any customer wanting a planer from DeWalt. Note: we also reviewed its successor: the DW735X, and in this post we compare the two. Maybe considering the DW734 instead? We compare the two here too.